Don't miss this opportunity to meet Tim in person and to hear him perform his debut classic 'Saranghamnida' (I Love You) live for the first time in Malaysia. 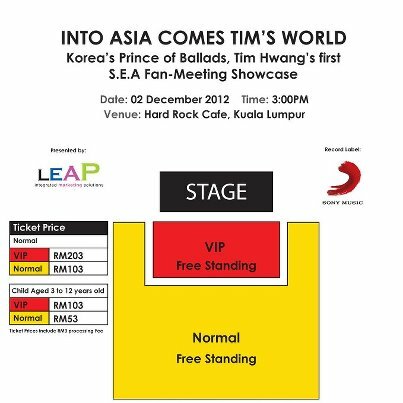 Tim will his first fan meeting in Malaysia on 2nd December 2012 (Sunday) - 3 pm at Hard Rock Kuala Lumpur. Actually, the ticket already be sale on 5th November 2012, 3 pm. I'm not sure the ticket already sold out or not, you guys can look at ticketcharge website or their outlets. Tim Hwang (팀) - "INTO ASIA COMES TIM'S WORLD" Malaysia Greetings!